LEANNE! I’m so glad you posted this today. When I was visiting my parents a couple of months ago they had this insane paleo granola they buy at the store, but it’s not available where I live. I decided I’d just work out my own recipe but I haven’t gotten around to it yet. And now you’ve done it for me–this recipe is essentially just what I was going to try. LOVE! Yay! Thanks Kelsie! So glad I had good timing with this recipe! Be sure to let me know if you make it! I’m obsessed with granola but I’ve never tried a grain-free version. This is brilliant and I love the tropical flavors with the fruit and toasted coconut! I have a big bag of almonds in the freezer so I’ll have to try it with those! Thanks Marcie! Using almonds is a great idea! Keep me posted! Thanks for pinning Kim! Yes, grain-free! 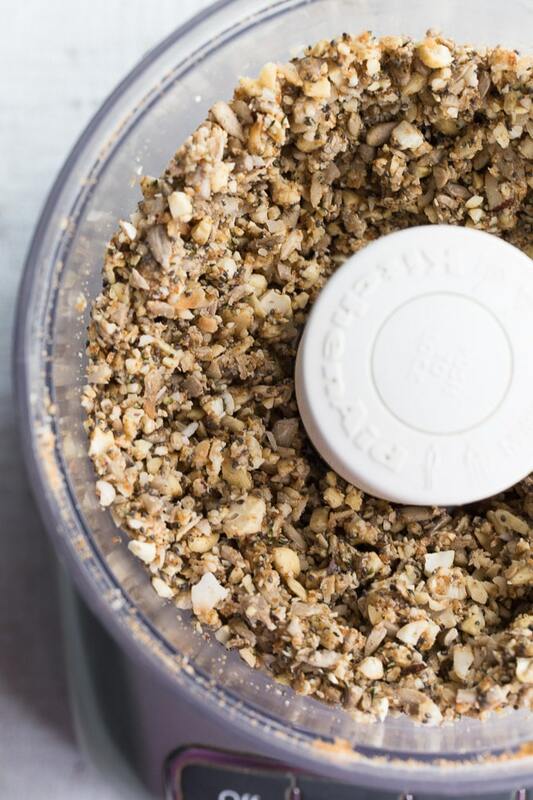 Of all the granola recipes I make, I finally posted a grain-free one! Add coconut to anything and I’m a happy camper Leanne! 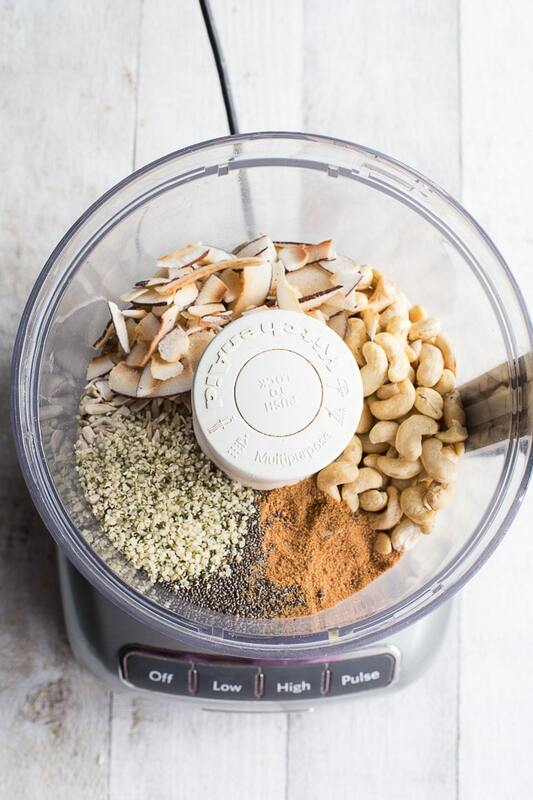 Love that this recipe is grain free too. Can’t wait to give it a try! This looks so tasty, Leanne! Thanks for the healthy recipe! Thanks Jen! Happy you like it! 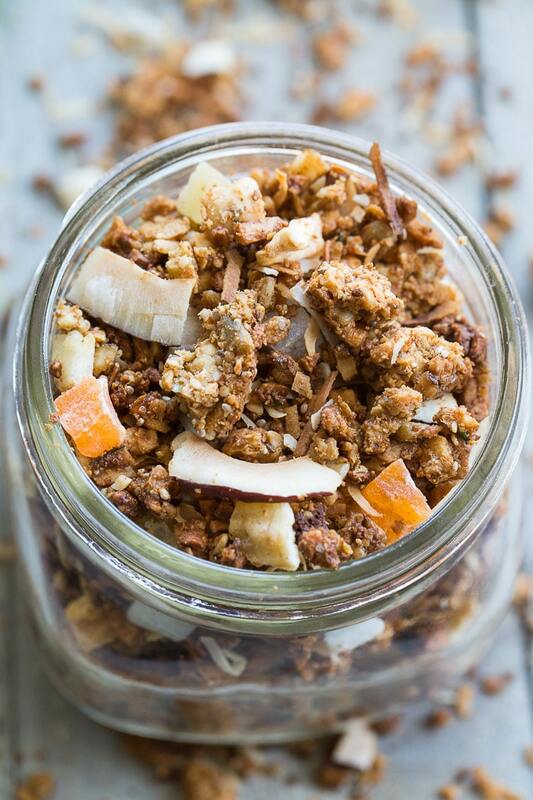 Coconut is my jam and so is granola so I’m totally love the flavours goin’ on here. I love putting granola over Greek yogurt – it’s a go-to for that 10-ish snack when the hunger bug strikes. I could eat a serious amount of this one 🙂 Hope you have a wonderful week, Leanne! Thanks Dawn! 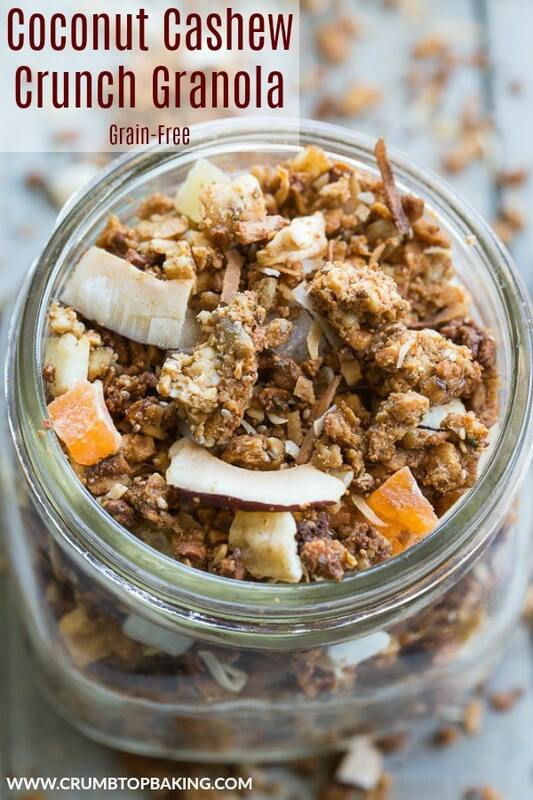 This granola is usually paired with fruit and almond milk for breakfast, or my 10am snack! There’s something about that hour that just gets my stomach growling! Hope you’re having a fantastic summer! Yeah, I’m straight up in love with this granola! It seriously looks and sounds amazing! Sorry, I haven’t been on your site in a while, I’ve been fighting (and winning) an ongoing fight with the city in my neighborhood. UGh, it’s been 90-degrees for the last two weeks and I can’t stand it anymore! We don’t have AC so I’m bunkered down in my basement. I finally wised up and brought my computer downstairs so I can get some work done. Anyway, I hope you’re doing great and I can’t wait to keep up with your blog! I’m obsessed with your photos. Hi Christina! No worries! Good to hear from you. Summer is a hectic (and warm time)! I hope you’re having a great summer and getting lots of camping in! And good luck with your city fight. As always, thanks for your support! 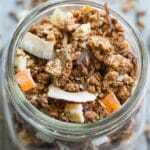 The combo of flavors is amazing in this granola! I have to be honest I am not a huge granola eater because its so calorie dense and I go overboard, but this is one of the best of have seen! Thanks Patrick! You’re too kind! And I can totally relate, it’s easy to go overboard with granola! 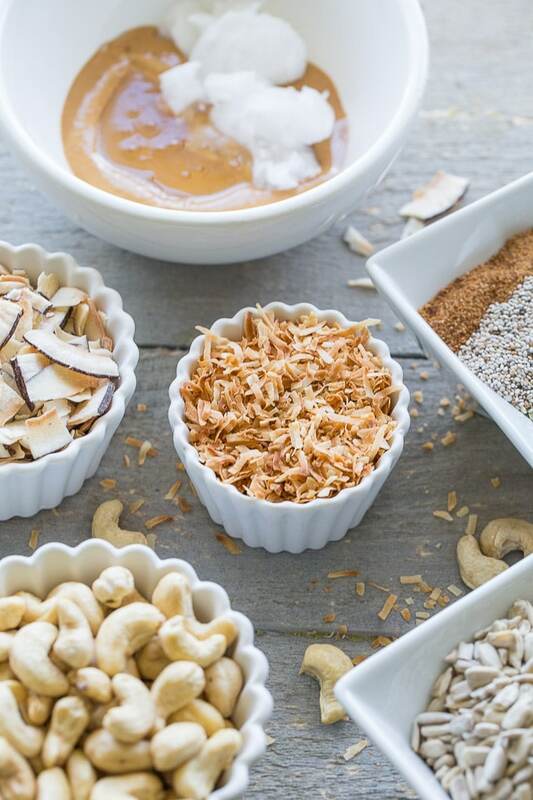 I love granola and this coconut cashew crunch sounds like a must try! It will mostly likely disappear in mere minutes! Lovely photos as well! Thanks so much Marisa! A batch of this doesn’t last long in my house. And that’s only with me eating it! Hope you’re having a great summer! I love that this is grain-free, Leanne! I can’t wait to try it. The only thing I’m missing are the coconut flakes, so I’ve added it to my Costco list asap!! It looks so good!! Thanks Katherine! Gotta love Costco. I’m always adding things to that list! 😉 Hope you like this one! Wow..how do your pictures keep getting better and better?? Thanks Terry! Appreciate it. You’re too sweet! This looks so insanely delicious!! Love the cashews and sunflower seeds! Thanks Lisa! I’m on a bit of a cashew kick lately! This is perfect road trip food! Precisely what I love for our road trips up north! A lovely combination of flavors and textures! Thanks Annie! Granola really is a perfect road trip snack! Hope you’re having a great summer! Always looking for new ways to dress up my yogurt! 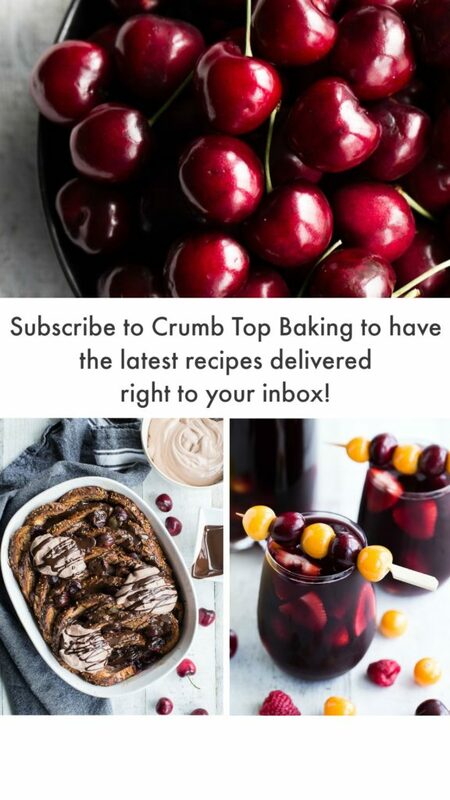 Seriously can’t wait to try this recipe Leanne – Anything with toasted coconut has my attention! Thanks Lizzy! Yes, I figured out the dark pan tip the hard way by burning way too many batches of granola! 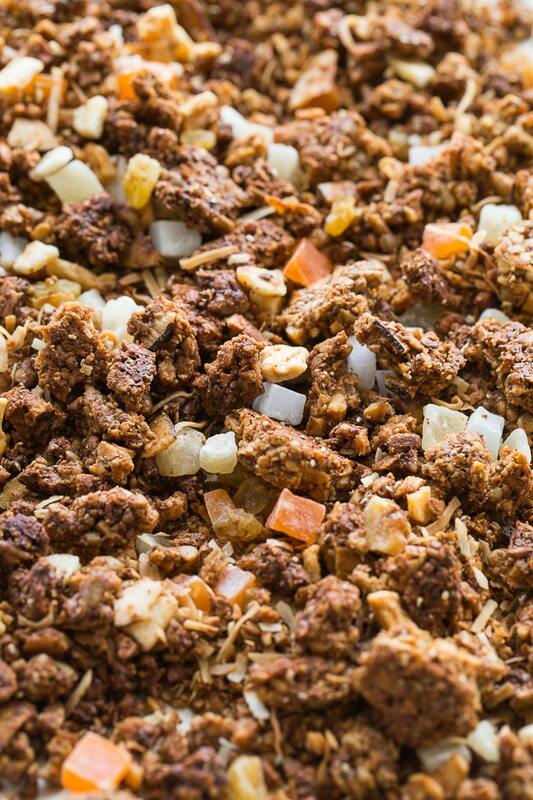 I hope you get a chance to make this granola. I just made another batch today!